In Graham Taylor’s first period in charge, wins against the Gunners were commonplace, but times have changed and we travelled to the Emirates with very little hope of anything other than a harsh defeat. After the dreadful game on Sunday, I had spent my day at work with a very heavy heart, wondering why I was subjecting myself and, more importantly, my niece to another night of misery. The fact that the club had decided not to move the game to Wednesday, despite playing on Sunday, seemed to indicate that they had written it off and would concentrate their efforts on Saturday’s game at home to Burnley. The match had taken on an extra significance as it was on the eve of GT’s funeral. For that reason, the scarf that I bought from Peter Percy in Hemel in 1979, which has not left the house in many a year, got an airing. Pre-match the City Orns gathered and shared predictions. Most were for a heavy defeat. Mike mentioned that he had got in the habit of betting on 2-1 for every game, but thought he’d give it a miss for this one. Team news was that there were nine changes from Sunday, with only Britos and Kaboul keeping their places. This would be our first chance to see our intriguing new signing, M’Baye Niang. So the starting line-up was Gomes; Cathcart, Kaboul, Prödl, Britos; Behrami; Janmaat, Cleverley, Capoue, Niang; and Deeney lining up in a 4-1-4-1 formation. There was a positive start to the game from the Hornets, but it took us all by surprise when Cleverley played a short free kick to Kaboul who, with the assistance of a slight deflection, fired past Cech to put the Hornets into a totally unexpected lead. I couldn’t help but despair at the modern football fan, as the away crowd decided that the most appropriate chant to celebrate going a goal up against Arsenal at the Emirates was “How sh*t must you be, we’re winning away.” The voice of reason/Cassandra next to me warned, “It’s too early.” But, no sooner had we come to terms with the fact that we had scored, than we had a second. Capoue went on a storming run from the halfway line, his shot was blocked by Cech, but rebounded to Deeney who poked it into the empty net. This goal was greeted with a mental celebration and “This is the best trip I’ve ever been on.” Much better. There was a long way to go, but this was incredibly impressive from the Hornets. The home side were forced into an early substitution as Oxlade-Chamberlain came on for the Ramsey, who had picked up an injury. 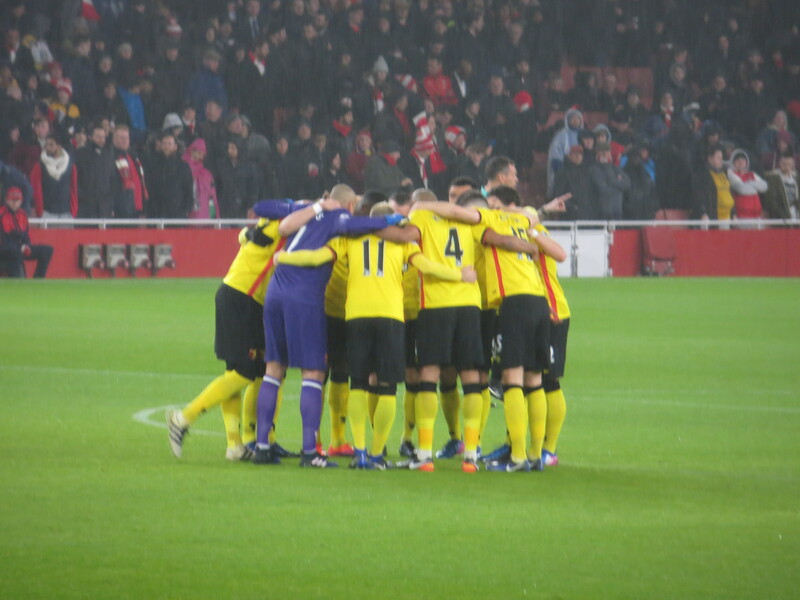 The Arsenal players were becoming increasingly frustrated as Watford continued to dominate, and Gabriel was booked for hacking down Niang. 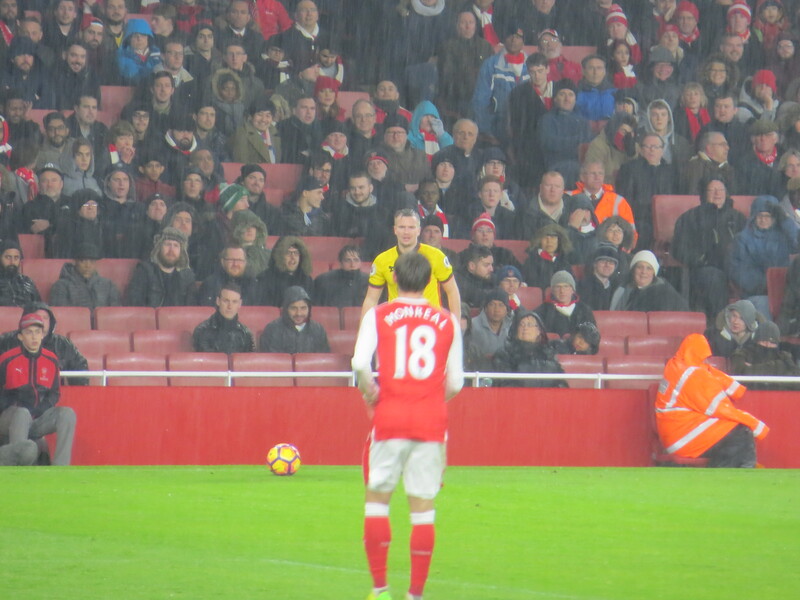 My heart was in my mouth as Monreal went down in the Watford box. The referee blew up and I thought he was about to point to the spot but, instead, he pointed at the Arsenal man and brandished a yellow card for diving. 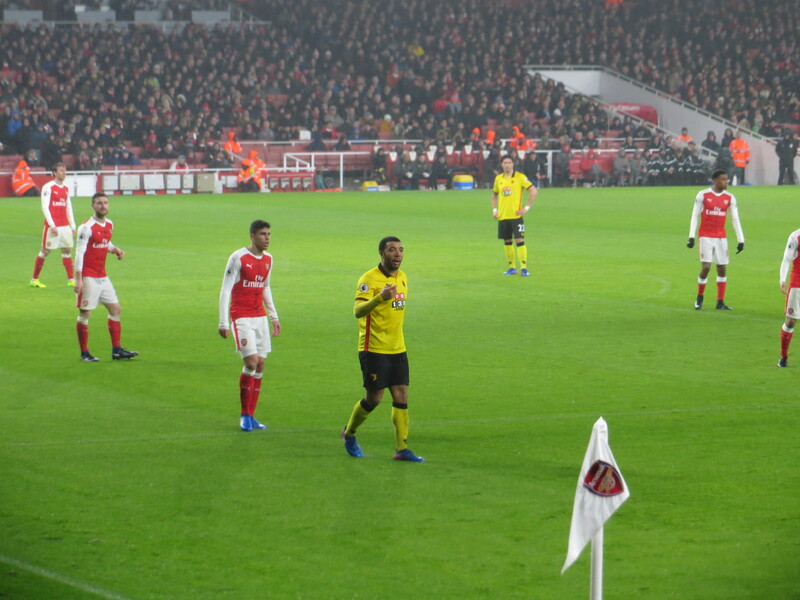 Watford continued to threaten the Arsenal goal as Janmaat played a short pass to Capoue on the edge of the area, but his shot was comfortably saved by Cech. The Frenchman then went on another run, this time down the wing to the byline, before crossing for Prödl whose header had to be tipped over by Cech. Watford had another great chance to increase their lead after a corner was repelled to Britos, who belted a shot that was blocked by Giroud. Janmaat was the next to try his luck, meeting a cross from Deeney with a shot that required a great save from Cech to keep it out. Capoue, who was playing a blinder, again won the ball in midfield before finding Janmaat who crossed for Niang, whose first shot for the Hornets flew over the bar. There was a rare foray by the home side into the Watford box, but Sánchez’s effort was well over the bar. The Chilean had another chance to threaten the Watford goal when he received the ball in the box, but Cathcart just took it off his feet. Wenger made a substitution at the start of the second half, replacing Giroud with Walcott. 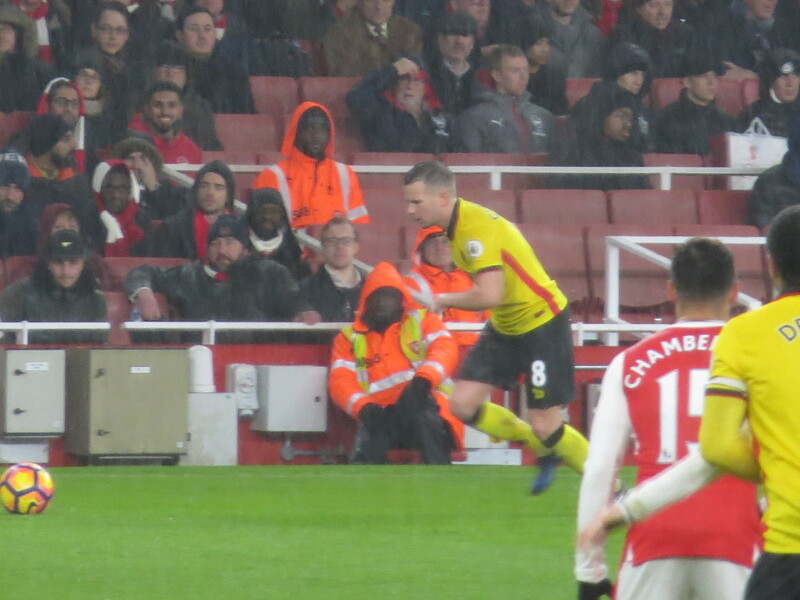 The substitute was involved almost immediately as a ball from Koscielny found him on the right of the box, but his shot was wide of the near post. Arsenal were a changed team since the restart and Iwobi beat Cathcart on the wing before crossing for Walcott whose shot was blocked by Gomes. The Watford keeper was in action again soon after, stretching out a hand to grab a shot from Iwobi. Özil was the next to threaten the Watford goal with a shot from the edge of the box, but Gomes was equal to it. The home side finally got the breakthrough on 58 minutes as Sánchez chipped a ball over the defence to Iwobi who volleyed in off the post. Mazzarri’s first substitution was an odd one, replacing Behrami, who had been excellent, with Doucouré. I can only think that Behrami was flagging as I would have preferred his defensive presence. Watford had a rare second half attack as Deeney ran into the box before going to ground, but the referee waved play on. 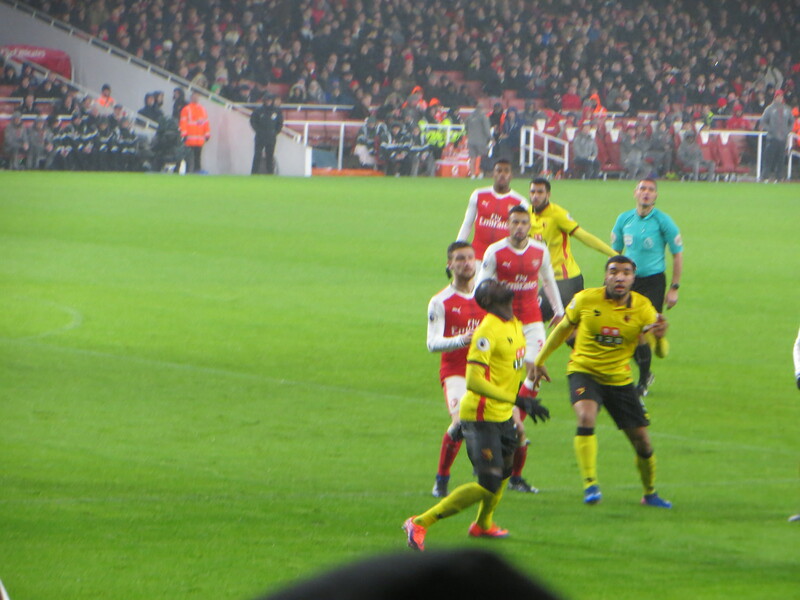 Both sides made substitutions around the midpoint of the half with Lucas replacing Coquelin for Arsenal and Watford new boy, Niang, making way for Success. The customary chants and applause for GT rang out soon after, although they were a minute early by my reckoning. Arsenal’s next goal chance came with a shot from distance by Gabriel, which flew a mile over the bar. At the other end a corner from Capoue was headed well wide by Cathcart. At this point, my nerves were shot and I turned to my niece, “I’m too old for this!” “I’m too young for this!” was the retort. 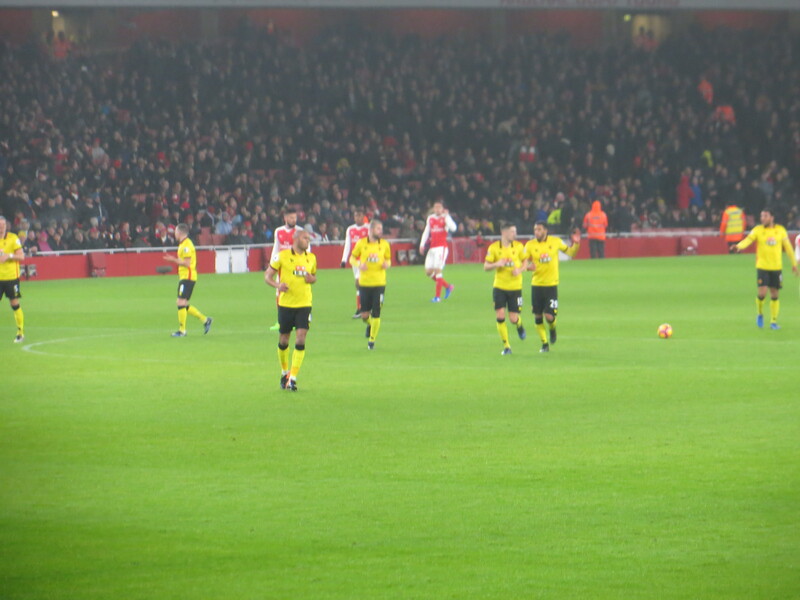 Into the last 10 minutes and Arsenal won a free kick on the edge of the Watford box. It was in a dangerous position, so I was greatly relieved when it hit the wall and went out. The resultant corner was headed out, but only as far as Monreal whose shot was, thankfully, well wide of the post. Mazzarri’s second change was to replace Deeney with Okaka. After the Italian’s poor showing on Sunday, I was doubtful about this change as well. Lucas had a great chance to grab the equalizer as he latched on to a throw and unleashed a powerful shot that rebounded out from under the crossbar. Having been counting the seconds since the Arsenal goal, it was almost physically painful to see the board held up informing us that we would have to survive for another five minutes. But the nearest the home side came to the equalizer in time added on was a weak shot from Lucas that was easily gathered by Gomes. As the various injury time stopwatches among the away crowd ran down to zero, Watford won a corner and there was hardly time to take it before the final whistle went to ecstatic cheers from the away end. “That was for you, Graham,” yelled my sister, echoing the thoughts of every Watford fan in the ground. As we applauded the players, I spotted a bloke in a black puffer jacket with a huge smile on his face. Flipping heck, that’s Walter! Although it has to be said that Paolo de Toffol completely outdid him in the mental celebration category. All of the players came over to applaud the fans and to give their shirts away. It had been a magnificent performance by the whole team. The energy and attacking purpose in the first half had Arsenal in disarray. In the second half, when the home side were in the ascendancy, the defence had been solid and well organized and Gomes was rarely troubled. A special mention must go to Capoue who, having been largely anonymous for some time now, put in a man of the match performance running the Arsenal defence ragged, particularly in the first half. The newcomer, Niang’s, debut was very pleasing with one particularly memorable moment when he beat Gabriel on the wing and went on a run that was only stopped when he was fouled. On tonight’s showing, I am expecting great things from him. As the crowd and the players celebrated together at the end of a wonderful night of football, there was only one chant that seemed appropriate and “One Graham Taylor” rang out from the away end. This was a performance that he would have been proud of and there is no higher praise for a Watford team than that. This entry was posted in Watford FC and tagged Aaron Ramsey, Abdoulaye Doucoure, Alex Iwobi, Alex Oxlade-Chamberlain, Alexis Sanchez, Arsenal FC, Arsene Wenger, Craig Cathcart, Daryl Janmaat, Etienne Capoue, Francis Coquelin, Gabriel, Heurelho Gomes, Isaac Success, Laurent Koscielny, Lucas Perez, M'Baye Niang, Mesut Ozil, Miguel Britos, Nacho Monreal, Olivier Giroud, Petr Cech, Sebastian Prodl, Shkodran Mustafi, Stefano Okaka, Theo Walcott, Tom Cleverley, Troy Deeney, Valon Behrami, Walter Mazzarri, Watford FC, Younes Kaboul on February 2, 2017 by franelynn. Excellent report as usual, do not put that scarf away…mine is now going to be worn with extra pride !! !